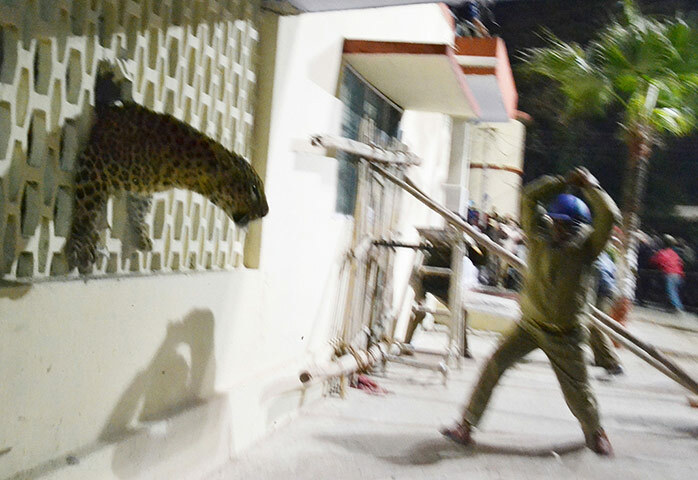 Leopard comes into contact and clashes with people in India and is seen squeezing through a hole in the wall of a hospital while a policeman is about to hit it as hard as possible. The two big cats of India, leopard and tiger, have no where to go. They are increasing coming into conflict with people. 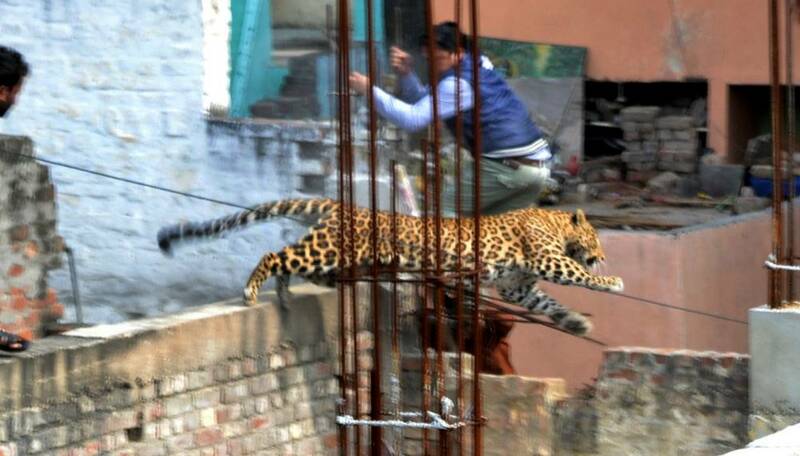 To see a large leopard wandering through the streets of a city in India looks crazy and it drives the people crazy. Although I have seen men showing off in trying to kill a leopard. It is a chance to be macho. Some leopards are not that large. The one in the photo is very large. There is nothing good about this. It is a complete failure for leopard and people. The leopard is sometimes surrounded and beaten to death by a large crowd. Horrible and unnecessary. It just should not happen. There is no longer a place in India for the once populous leopard. It is the same old story: human population expands and takes up a bit more of the leopard’s habitat. The leopard’s prey is gradually killed off by people and so the leopard begins to encroach into areas populated by people where it is totally incompatible with them and completely out of place. The leopard is a cunning predator and it can kill a person if desperate enough. Where will it all end? There is only one outcome, which is a dead certainty – no more leopards in the wild in India. It will take time but the time will come. Humans are just totally unable to manage the planet so that we can live in “harmony” with other species. The word “harmony” makes me laugh, so far from it are we. My thanks to Marc for find the picture which is credited AP/Getty Images but I believe it to be in the public domain. This entry was posted in leopard, leopard conflict with people, Tiger, tiger conflict with people, Wild Cat Species and tagged common leopard, leopard, leopard conflict with people, Leopard Picture, leopard range, wild cat species by Michael Broad. Bookmark the permalink. yea michael its not looking good. Very disturbing. Really wish that village idea was real. What is happening in India is a warning as to what will happen everywhere if people go on as they do now! The selfish, greedy, arrogant, ever breeding, ever expanding human race are taking everything from other species and if we are not wiped out first then all of Nature will be. I shudder for future generations and am very glad I will be leaving no descendants in this world of uncertainty! We are leaving a mess for future generations both environmentally and economically. There is still massive national debt. We seem unable to control ourselves. Well, when I get that big island I’ve talked about wanting, There will be a place for all beings with just a couple handsful of humans. Yup! Cats of all kinds and POCers only. Fish will be plentiful but, since cats and some POCers are meat eaters, we’ll have to have some livestock, especially chickens. I think Michael should be assigned to “do the deeds” unless someone else will volunteer. We’ll need to come prepared with everything we’ll need to raise fruits and veggies. We will create separated parcels, each with appropriate habitats for each kind of cat, and a small village for humans. Woody will be in charge of building a bathroom (AND USING IT) and doing laundry. He will, also, be confined to the village, so he won’t have any pee pee accidents hopefully. He will be subjected to our educational cat lectures daily. Aside from tending animals and gardens, we will romp and play. Thanks for reading my fantasy. Like, perhaps, 90% of humankind you want a different (better) world just like me. I am happy to do the deeds whatever they are 😉 But I can’t kill animals if that is what you mean so we’ll have to go veggie. Now, that’s a dilemma. The cats can’t go veggie, so somebody has to take care of that aspect. Woody would, probably, be perfect, but he can’t be trusted with sharp objects or any instrument of harm. Perhaps, we need to intice a butcher to live with us. We may, also, want to consider Jeff (spouse of Ruth MM) because he has building skills. As a Indian myself it seems the human population explosion and rapid de-forestation is slowly driving many animal populations to extinction in India.In 2014 the city of Mumbai has the highest human density/sq Km in the World and its a miracle that the “Sanjay Gandhi Park” situated in the city’s suburbs still has a wild leopard population.Small miracles do happen and similarly hope that future generations reverses the de-forestation trend and restores Indian wild-life to a healthy population. The preservation of the “Asiatic Lion” in the Gir forests of Gujarat is one of the World’s most successful conservation projects, a well managed and maintained national park that has saved the Asiatic lion from total extinction. What Mr. Furtado says hits home so hard. He has written about this before, and it motivated me to do more research into their plight, as well as the Bengal tiger (all tigers of every subspecies, est. fewer than 3,500 left in the wild) and many other big cat species. I encourage all readers to do their research on the where’s and why’s, and pin on Pinterest, tweet on Twitter, and post where ever is most practical. It breaks my heart to see this magnificent loner out there, so vulnerable. He is especially vulnerable because of his size. I feel for him, tremendously. And that photo that Marc found from his research is the one that is going up on my Pinterest boards and elsewhere. Thanks for this article, Michael. My pleasure but the photo shocked me because the leopard and people don’t mix and the photo highlights that. The leopard is like an alien from another planet in this photo. …Others are reporting at least two have been injured, mostly with cuts or scratches. Onkar Singh, senior superintendent of police, said: “We urged the public not to go near the animal, but they went close out of curiosity and the animal attacked them, inflicting minor injuries.”Last week another leopard killed a five-year-old boy in the central state of Chhattisgarh, the latest in a string of incidents raising concerns about depleting habitats for big cats which is forcing them into populated areas. This seems typical. This magnificent cat is a curiosity, a freak show. It is awful. Thanks for the extra info. Cal. The reason why your comment was held for moderation is because the anti-spam software detected two links which indicates spam. I meant to add this: the Amur or Siberian tiger is now est. at less than 40 individuals left in the wild. So close to extinction. What a tremendous loss this will be if it is allowed to happen. We have lost so many species in this grand, grandiosely human-schemed world of ours. I feel for him too. I don’t care about the people. I care about this cat who is out of place, unwanted, isolated, alone in a human dominated world that is fearful of him. Bloody crazy world. Thanks Rudolph for reminding me that there are some successes. I just have this pessimistic vision of the future for wild cats because of the long term trend which is less and less of these cats in the wild. It is weird, but I feel sorry for the leopard while I expect that not one Indian feels the same way. Good grief! I knew I should’nt have read this. They have no place to go? WHY?